This week's Next 20 community builder is Maya Sciarretta, owner of Sugo Sauce and Pazzo Chow. Sugo Sauce was born as the result of a relationship between Nonna and Nipote (grandmother and grand-daughter in Italian). Nonna and Nipote bonded and connected through the act of teaching and learning how to make Nonna's version of a common simple sugo recipe 'Classico'.Through her design degree from Emily Carr University she gained the requisite technical expertise and theoretical footing to produce original artistic and commercial work in a variety of mediums.This experience made it tangible for Maya to fuse her true loves: relationships + visual communication + food = Sugo Sauce. In 2014, Maya opened Pazzo Chow, a small food-retail establishment in the heart of Vancouver's Chinatown. I would say it's a mindset and an activity. To be able to let yourself get lost in flow and actually feel free enough to create something in that time. There's creativity in everything, it's not like what most people think as painting or drawing, it's always there. It's an abstract way of thinking and everybody has it. Some people access it more than others, other people haven't accessed it but it doesn't mean it’s not there. I was lucky enough to go to be able to go to school to learn skills and behaviours on how to express my creativity. What inspired you to start Pazzo Chow? I need to be passionate about what I wake up to and do all day. That was something that was refined as I got older and educated. I started a pasta sauce brand called Sugo Sauce and it was going really well. I was really passionate about the product but what I was most passionate about was the experience of eating with people and talking about food and getting excited about get-togethers. So I thought, how about I start a retail shop that revolved around the sauce and sold products that I believed in and created an environment for people to come in and talk about what they're going to make and get inspired with Italian food. I would consider everything I do every day as creative. Every aspect of Pazzo Chow is creative. I am totally selfish about being creative, we look at everything from colour to texture. We solve the problem of people wanting food and being satisfied, happy and healthy. That enables me to be creative. Pazzo Chow to me is a way to enjoy what I am inspired about; people connecting around food but also being able to feed people because everyone needs to eat. It is a career for me to be able to enjoy my expression of creativity. My Nonna is an inspiration to me. I put all these amazing images of her in the bathroom so that it would ground me. Working in this place, it's easy to lose track of what's important to you. Every time I go into the bathroom I'm connected to my passion for food, life and just plain old beauty. School gives you the opportunity to learn tools to express yourself. If you're lucky enough, you learn tools that will make you money, or help you discover who you are. It gives you a tangible way of figuring life out. For some people it's things like math or science. I have friends that knew they were amazing at math from a young age and they love it and that's what they do now. 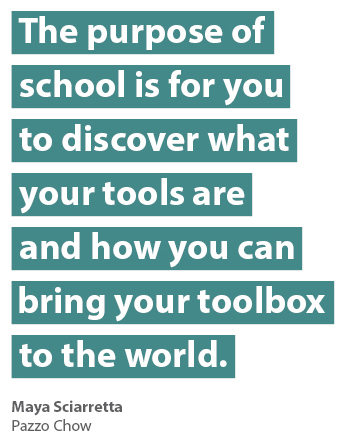 The purpose of school is for you to discover what your tools are and how you can bring your toolbox to the world. What role do you see the arts playing in education in the next 5, 10, 20 years? I think art should be mandatory. The arts are not an add-on. It's so important to give young people the opportunity and the support to figure out how they can express themselves. Everybody is creative and we can all access it if there is support, opportunities and they feel safe and inspired to share. That's one of the most amazing connection we can have as human beings.